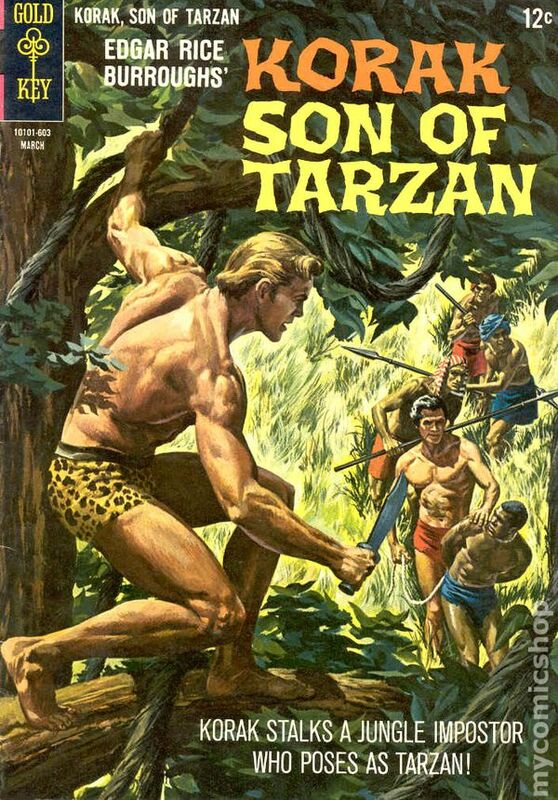 Published Jan 1964 by Gold Key/DC. 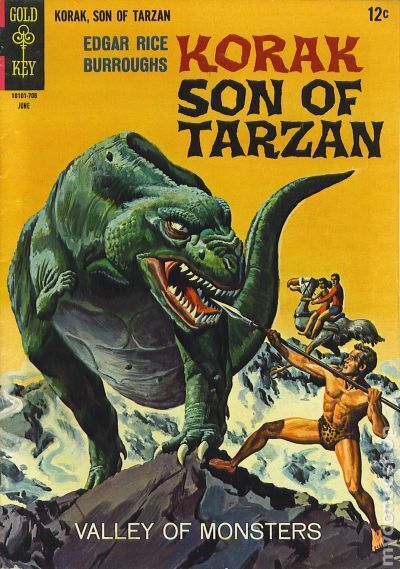 Russ Manning art in "Korak Son of Tarzan!" and "Safari of No Return!" Backup feature Jon of the Kalahari begins with "The Whispering Death!" Painted front and back covers. # on cover 10101-401 January #1 1/64 12c Cover price $0.12. Published Mar 1964 by Gold Key/DC. Staple rust with Rust migration. Centerfold detached. Russ Manning art in "Panic on the Beach!" and "The Fury of Go-Zan!" Backup feature Jon of the Kalahari in "The Royal Buck!" Painted front and back covers. # on cover 10101-403 March #2 3/64 12c Cover price $0.12. Published May 1964 by Gold Key/DC. Russ Manning art in "Captive of the Vulture!" and "Warrior's Test!" Backup feature Jon of the Kalahari in "The Lonely Hut!" Painted front and back covers. # on cover 10101-405 May #3 5/64 12c Cover price $0.12. Published Aug 1964 by Gold Key/DC. Russ Manning art in "Wizard's Gorge!" and "Warrior from the Past!" Backup feature Jon of the Kalahari in "The Hunter!" Painted front and back covers. # on cover 10101-408 August #4 8/64 12c Cover price $0.12. Published Oct 1964 by Gold Key/DC. Russ Manning art in "The People of the Tree!" and "The Earth Shaker!" Backup feature Jon of the Kalahari in "The Lost City!" Painted front and back covers. # on cover 10101-410 October #5 10/64 12c Cover price $0.12. Published Dec 1964 by Gold Key/DC. Painted cover art by Morris Gollub. "Wild Animals of Africa, Number 12: Cheetah" Keys of Knowledge non-fiction page. "Ordeal by Lightning," script by Gaylord Du Bois, pencils by Russ Manning, inks by Tony DiPaola; Korak rescues a native prince and helps him reclaim leadership of his tribe, while saving a group of European settlers from their aggression. "Warrior of the Deeps," script by Gaylord Du Bois, pencils by Russ Manning, inks by Guillermo Cardoso (Bill Cardoso); Armed only with a knife, attempting to rescue the captain, Korak finds himself wrapped in a giant octopus embrace and on the verge of drowning. "People of Australia, Number 2: Tasmanians" Keys of Knowledge non-fiction page, art by Joe Certa. 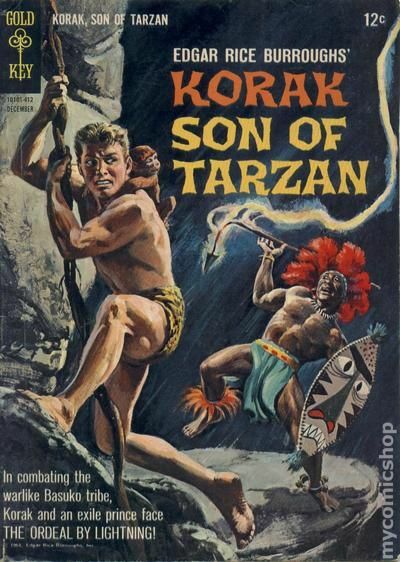 Korak, Son of Tarzan Pin-Up illustration by Morris Gollub (same as cover but without logo or lettering). 36 pgs., full color. Cover price $0.12. 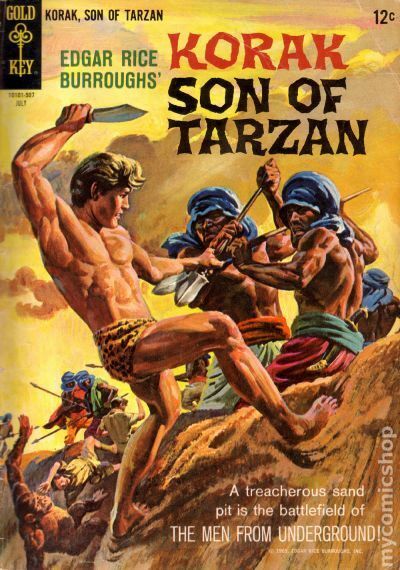 Published Mar 1965 by Gold Key/DC. Painted cover art by Morris Gollub. "Wild Animals of Africa, Number 16: Greater Kudu" Keys of Knowledge non-fiction page, art by Joe Certa. "Challenge of the Avengers," script by Gaylord Du Bois, art by Russ Manning; Korak rescues a warrior from two lions, three French soldiers from thirst, and the warriors sister from a forced marriage with her abductor. "King of Beasts" starring Jon of the Kalahari, script by Gaylord Du Bois, art by Jesse Marsh. "Wild Animals of Asia, Number 2: Cobra" Keys of Knowledge non-fiction page, art by Joe Certa. 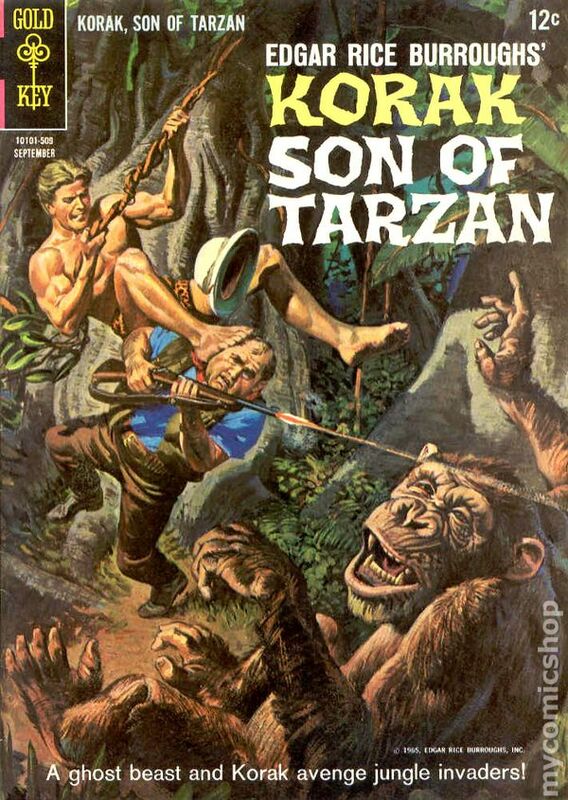 Korak, Son of Tarzan pinup by Morris Gollub (same as cover but without logo or lettering). 36 pgs., full color. Cover price $0.12. Published May 1965 by Gold Key/DC. Painted cover art by Morris Gollub. "Wild Animals of Africa, Number 13: Okapi" Keys of Knowledge non-fiction page, art by Joe Certa. "Lair of the Dragon," script by Gaylord Du Bois, art by Russ Manning; Korak rescues three Peace Corps volunteers from a plane wreck, a lost cave city from a water dragon, and the female Peace Corps volunteer from a forced marriage with the overly grateful king. "The Peace Corps: America's Unofficial Ambassadors" article. "Medicine Man," script by Gaylord Du Bois, art by Jesse Marsh. "Lie Detector of Zululand" one-page non-fiction story, art by Tony DiPaola. "Mabudu Money! ", art by Tony DiPaola; Information on the Mabudu currency, which is Leopard teeth. "Wild Animals of Asia, Number 3: Elephant" Keys of Knowledge non-fiction story, art by Joe Certa. 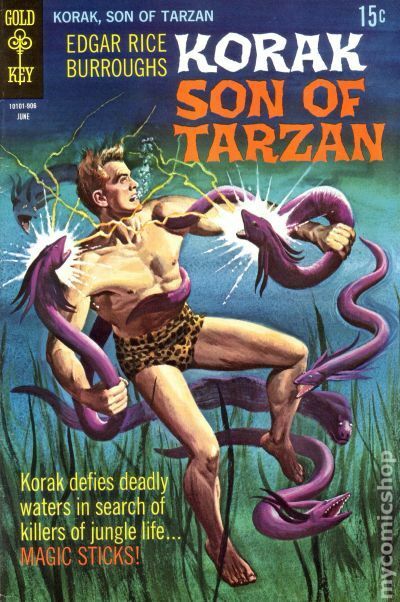 Korak, Son of Tarzan pinup by Morris Gollub (same as cover but without logo or lettering). 36 pgs., full color. Cover price $0.12. 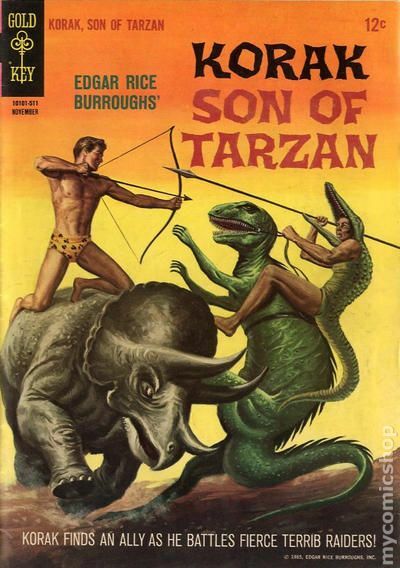 Published Jul 1965 by Gold Key/DC. Painted cover art by Morris Gollub. "Wild Animals of Africa, Number 18: The Genet" Keys of Knowledge page, art by Joe Certa. "The Men from Underground," script by Gaylord Du Bois, art by Russ Manning; Korak guides a group of geologists through the desert to search for oil, defeating hostile villagers along the way; Lured into a sandpit by some villagers, along with Pahkut and a group of thirsty geologists he is guiding through the desert, the gullible jungle boy is ambushed and knocked unconscious by one of the villagers. "Unusual African Fish" article, art by Mike Arens. "Across the Sahara By Bus" article. "Thirst Is a Leopard!" starring Jon of the Kalahari, script by Gaylord Du Bois, art by Jesse Marsh. "African Birds" non-fiction page., art by Mike Arens. "People of Asia, Number 2: The Nepalese" Keys of Knowledge story, art by Joe Certa. 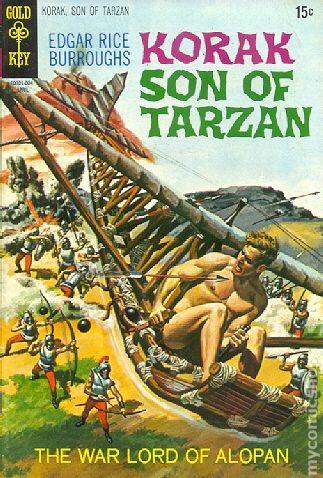 Son of Tarzan pinup by Morris Gollub (same as cover but without logo or lettering). 36 pgs., full color. Cover price $0.12. Published Sep 1965 by Gold Key/DC. Cover Detached at one staple. Centerfold detached at one staple. Painted cover art by Morris Gollub. "African Dog and Wolf Family" article, art by Mike Arens. "When the Rhino Charged," script by Gaylord Du Bois, art by Russ Manning; Korak rescues a female doctor and her peaceful native village from an outlaw and his henchmen. "King of Beasts" article, art by Mike Arens. "South African Headdresses" article, art by Mike Arens. "The Pit," script by Gaylord Du Bois, art by Russ Manning; Korak saves the wives and children of the former king from being buried alive with his body. "Hunter's Risk" starring Jon of the Kalahari, script by Gaylord Du Bois, art by Jesse Marsh. "Animal Tree Homes: article, art by Mike Arens. "Elephant Capers" article, art by Mike Arens. 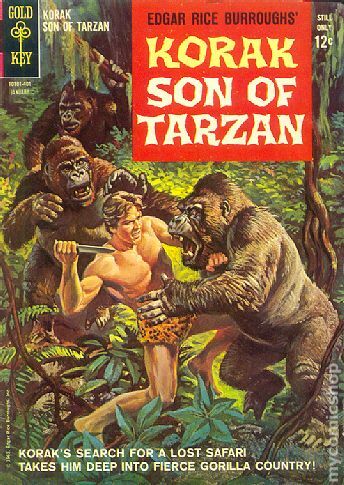 Son of Tarzan pinup by Morris Gollub (same as cover but without logo or lettering). 36 pgs., full color. Cover price $0.12. Published Nov 1965 by Gold Key/DC. Painted cover art. 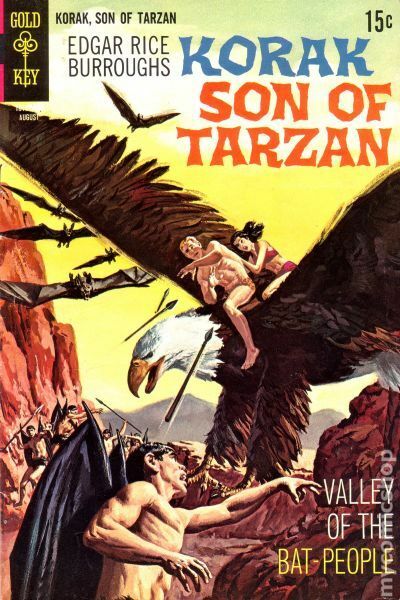 "Invasion from Pal-Ul-Don," script by Gaylord Du Bois, pencils by Russ Manning, inks by Guillermo Cardoso (Bill Cardoso); Korak helps the stork people drive off the crocodile-skin-clad terribs, alerts a Masai tribe to a carnivorous dinosaur which has cornered their cattle, and tames a prehistoric gryf that defeated the dinosaur. "The Lion Killers" article, art by Mike Arens. "Jungle Musicians" article, art by Mike Arens. "Medicine Man" starring Jon of the Kalahari, script by Gaylord Du Bois, art by Jesse Marsh. 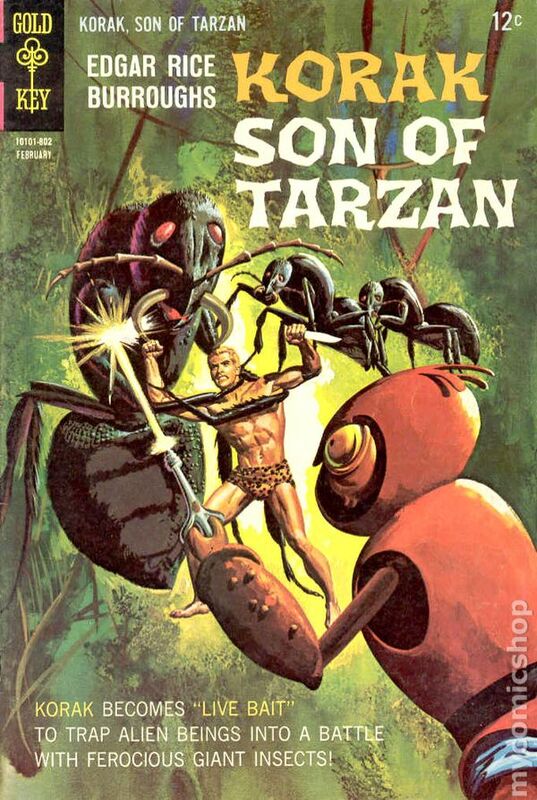 "The White Pygmies Strike Back," script by Gaylord Du Bois, pencils by Russ Manning, inks by Mike Arens; Korak helps the ant men drive off some thieving Oparians and then saves the Oparian queen La from the vengeful ant men. "Cantankerous Camels" article, art by Nat Edson. 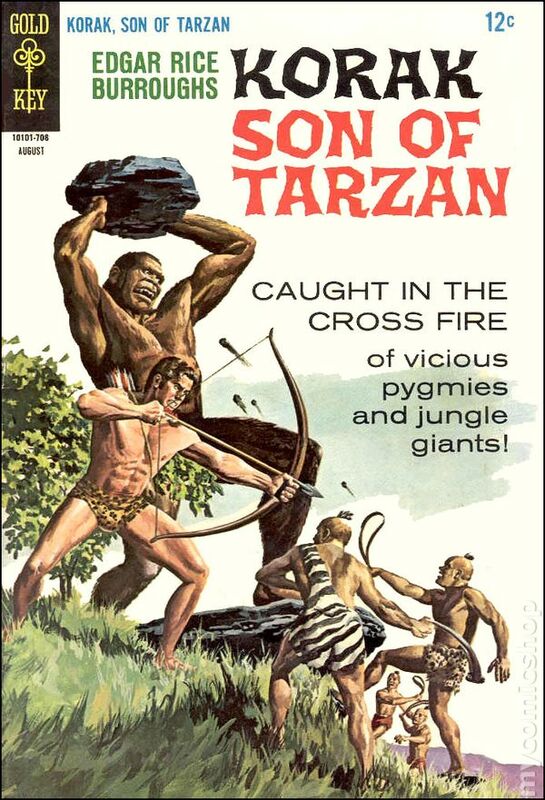 Son of Tarzan illustration (same as cover but without logo or lettering). 36 pgs., full color. Cover price $0.12. 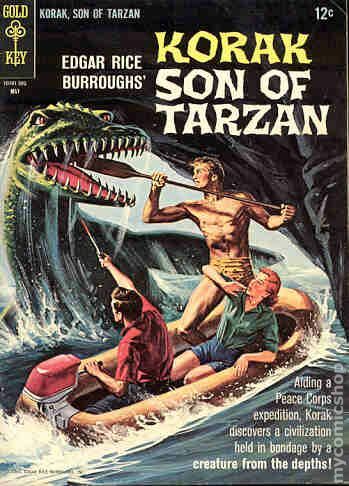 Published Mar 1966 by Gold Key/DC. Painted cover art. 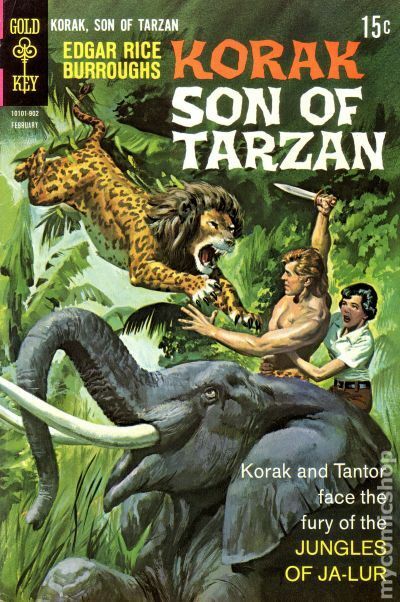 "The Impostor," script by Gaylord Du Bois, art by Warren Tufts; Korak helps a hot-headed chief rescue his son from an ivory-poaching Tarzan imposter. "The Eyes Have It" article, art by Mike Arens. "Tree Toppers and Tree Topplers" article, art by Mike Arens. "On Trial," script by Gaylord Du Bois, art by Jesse Marsh. "The Life Changers," script by Gaylord Du Bois, art by Warren Tufts; Korak defeats a mad scientists army of mutants and saves a recently captured native girl. "African Native Houses" article, art by Mike Arens. 36 pgs., full color. Cover price $0.12. 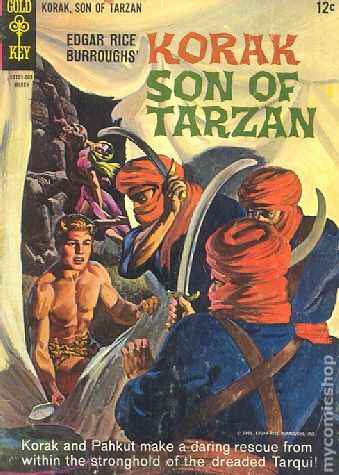 Published Jun 1966 by Gold Key/DC. Painted cover art by George Wilson. "Lotuka Rain Dance" one-page non-fiction story, art by Mike Arens. 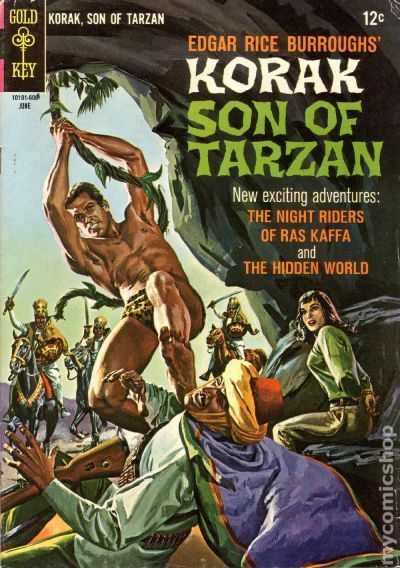 "The Night Riders of Ras Kaffa," script by Gaylord Du Bois, art by Warren Tufts; Korak protects a group of seismologists in an earthquake-prone castle from a warlord and his henchmen. 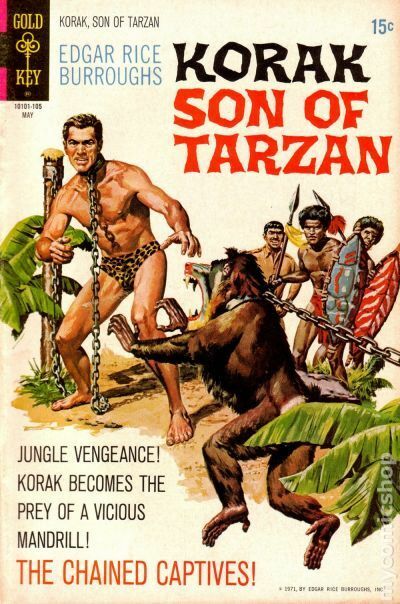 "The Hidden World," script by Gaylord Du Bois, art by Warren Tufts; Korak discovers an orphaned wild girl, raised by chimps, and returns her to civilization, after defeating some hostile tribesmen along the way. 36 pgs., full color. Cover price $0.12. 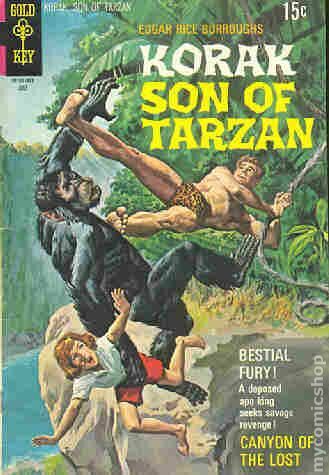 Published Sep 1966 by Gold Key/DC. Painted cover art by George Wilson. "Mermaids and Monsters" article, art by Mike Arens. 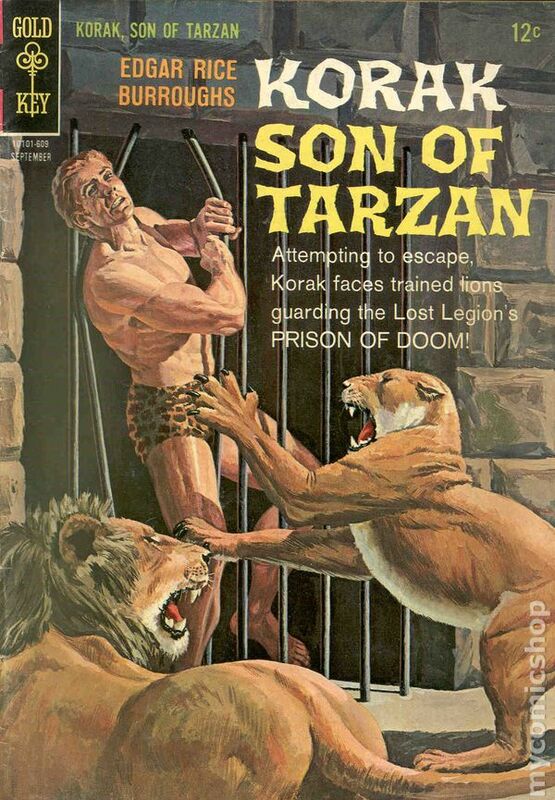 "Prison of Doom," script by Gaylord Du Bois, art by Mike Arens and Warren Tufts (heads); Korak saves a group of photographers first from some irate tribesmen and then from a superstitious Roman town where they seek refuge; "Kalahari Artists" article, art by Nat Edson. "The Face Saver" starring Jon of the Kalahari, script by Gaylord Du Bois, art by Jesse Marsh. "Perilous Passage," script by Gaylord Du Bois, art by Mike Arens and Warren Tufts (heads); Korak unites a young queen with her lover and helps them escape. 36 pgs., full color. Cover price $0.12. Published Dec 1966 by Gold Key/DC. Painted cover art by George Wilson. "The Battlers… Baboons" article, art by Nat Edson. "Spotted Magic," script by Gaylord Du Bois, art by Doug Wildey and Warren Tufts (heads); After rescuing a friendly tribal chief from poisoning, Korak pursues an evil witch doctor, who manages to turn the tables on the persistent youth several times. "Mountains of the Moon" article, art by Mike Arens. "Wrestling Giants" article, art by Nat Edson. "Fiery Passage" starring Jon of the Kalahari, script by Gaylord Du Bois, art by Jesse Marsh. "Fruit of the Giant Herb" article, art by Nat Edson. 36 pgs., full color. Cover price $0.12. 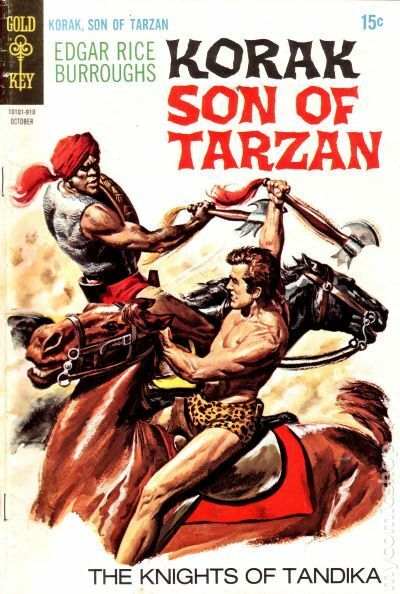 Published Mar 1967 by Gold Key/DC. Painted cover art by George Wilson. "Peoples of Africa, Number 11: The Berbers" article, art by Tom Gill. 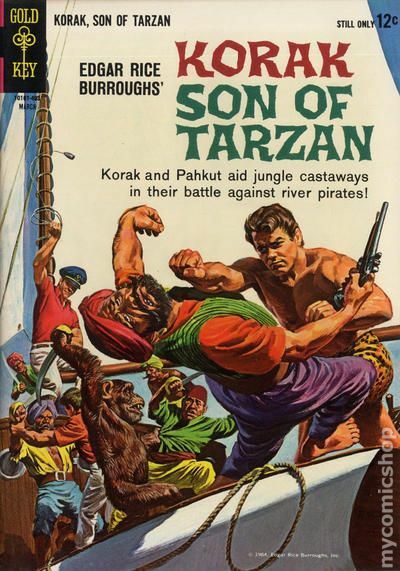 "Peril at Jade Lagoon," script by Gaylord Du Bois, art by Warren Tufts; After saving a boy from an army of red ants, Korak pursues an archaeological expedition which is gradually being taken over by an unscrupulous looter; While tracking the safari on an archaeological expedition, the jungle boy is struck on the back of his head with a club by hostile tribesmen, only to awaken to taunts of the tribesmen's plan to torture him to death. Jungle Safari Quiz. "Monkeys and Their Cousins" article. "Pandie's Capture" starring Mabu, Jungle Boy, script by Gaylord Du Bois, art by Nat Edson. "Jungle Birds" article, art by Jesse Marsh. "Fish, Number 25: Orca" one-page Keys of Knowledge story, art by Jack Sparling. 36 pgs., full color. Cover price $0.12. 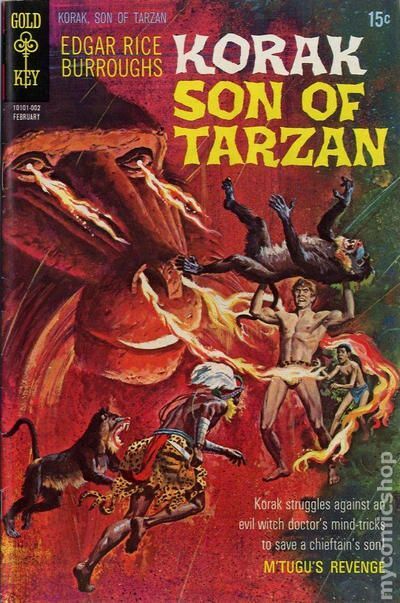 Published Jun 1967 by Gold Key/DC. Painted cover art by George Wilson. "The Caracal… An African Cat" article by Nat Edson. 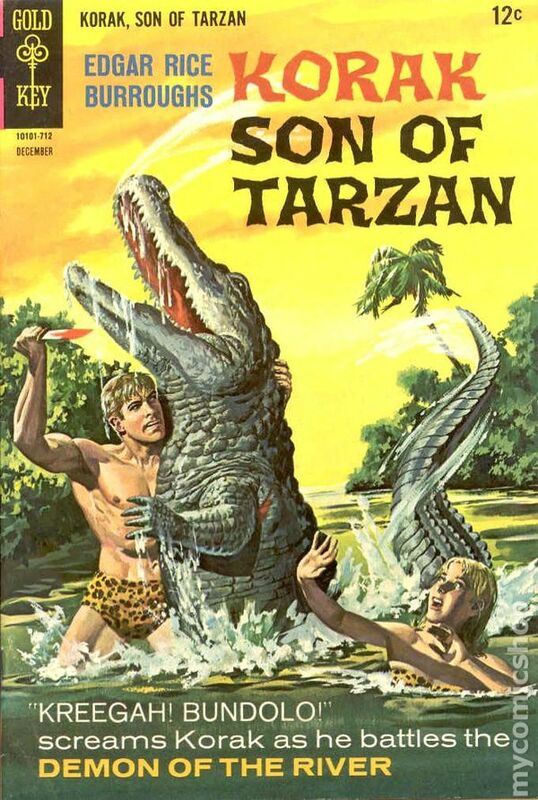 "Valley of Monsters," script by Gaylord Du Bois, art by Nat Edson; Korak rescues a man from a giant crocodile, rescues a girl from a carnivorous dinosaur, and helps the girls father regain control of his tribe. "The Rhino" text story. "Lion Hunter" starring Mabu and Kulu, script by Gaylord Du Bois, art by Nat Edson. 36 pgs., full color. Cover price $0.12. Published Aug 1967 by Gold Key/DC. Painted cover art by George Wilson. "Off-Shore Island" article. 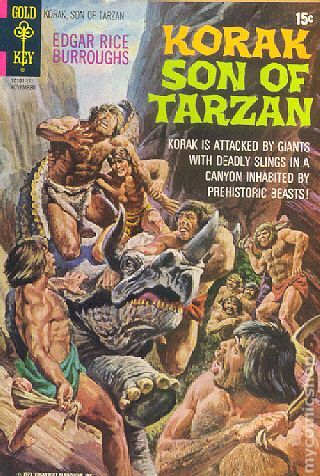 "Giant of Clay," script by Gaylord Du Bois, art by Nat Edson; Korak babysits a careless archaeologist and his daughter through a flooding valley populated with prehistoric cave peoples. "Africa, the Cradle of Man" article. "A Friend in Need" starring Mabu, Jungle Boy and Tanau, script by Gaylord Du Bois, art by Nat Edson. 36 pgs., full color. Cover price $0.12. Published Oct 1967 by Gold Key/DC. Painted cover art by George Wilson. 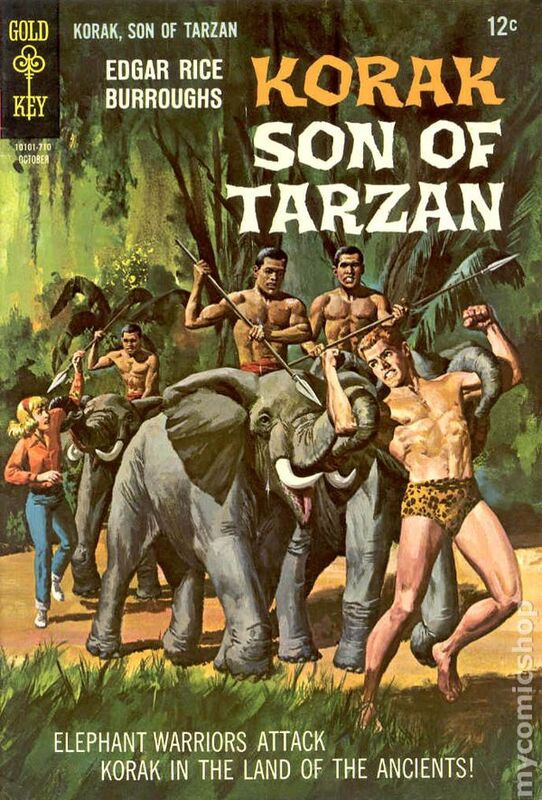 "The Living Fire," script by Gaylord Du Bois, art by Nat Edson; Korak saves a girl from a crashed plane, is captured by pygmies riding pygmy elephants, escapes a crazy queen, and leads the girl out of the valley; The captive jungle boy is led, with each wrist being held by the trunk of a pygmy elephant, to the beautiful queen who thinks he is her reincarnated lover. "Discovery KH-1" article, art by Nat Edson. "Mabu Races Death" starring Mabu, Jungle Boy and Kanai, script by Gaylord Du Bois, art by Nat Edson. 36 pgs., full color. Cover price $0.12. Published Dec 1967 by Gold Key/DC. Painted cover art by George Wilson. "Demon of the River," script by Gaylord Du Bois, pencils by Mike Arens, inks by Mike Royer; After escaping a group of carnivorous white apes, Korak saves a girl from a band of Neanderthals, fights a jealous brute, and is wrongly accused of his murder. "Mabu and the Black Bull," script by Gaylord Du Bois, art by Nat Edson. "Sheeta's Prey," script by Gaylord Du Bois, pencils by Mike Arens, inks by Mike Royer; Korak chases a monkey which has stolen his knife, bow, and arrows, leaving him to defeat a leopard unarmed and to save the monkey from a hungry eagle. "The Lotukas and the Termites" article. 36 pgs., full color. Cover price $0.12. Published Feb 1968 by Gold Key/DC. Painted cover art by George Wilson. "The Watering Place" one-page story, art by Mike Royer. "The Alien Jungle," script by Gaylord Du Bois, pencils by Russ Manning, inks by Mike Royer; After being captured and taken to an alien planet, Korak escapes and helps the humanoid inhabitants regain control of it. "Close Call with a Crocodile" text story. "Angry Waters" starring Mabu, Jungle Boy, script by Gaylord Du Bois, art by Tom Massey. "Lost Apeling," script by Gaylord Du Bois, pencils by Russ Manning, inks by Mike Royer. 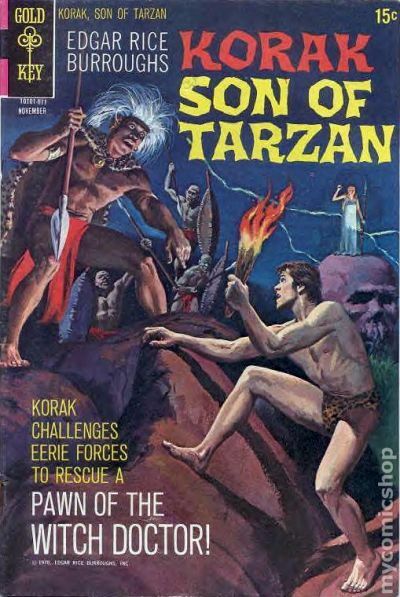 Korak saves an albino ape baby from an evil witch doctor. 36 pgs., full color. $0.12. Cover price $0.12. 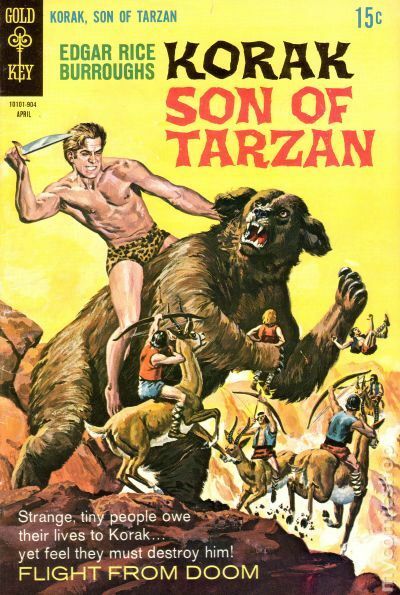 Published Apr 1968 by Gold Key/DC. Painted cover art by George Wilson. 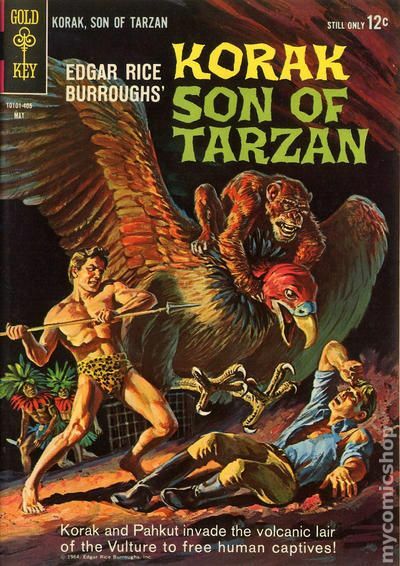 One-page Jungle Tales of Tarzan story featuring Teeka, script by Gaylord Du Bois, art by Mike Royer. 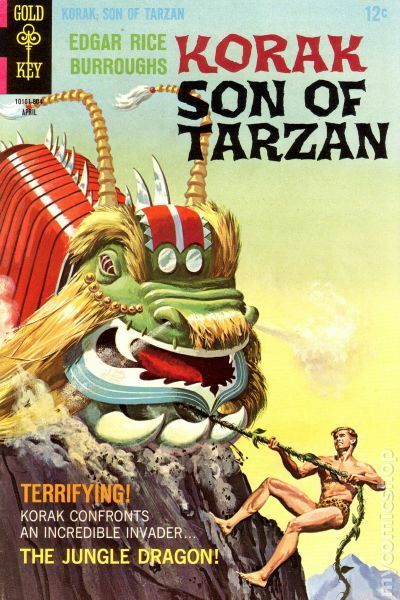 "The Jungle Dragon," script by Gaylord Du Bois, art by Alberto Giolitti and Mike Royer (heads); Korak is fishing with a black boy when a gigantic oriental dragon appears coming down the river; Korak climbs a tree and sees that it is actually a train with decorated cars that ride on tank tracks; The dragon hits the tree and Korak is dashed to the ground unconscious; Asian soldiers emerge and take him and the boy prisoner; When Korak awakes, the leader, named Sing Piau, interrogates him about a great stone lion in the mountains. "Stegosaurus" article. "The Lion's Quarry" text story. "Mabu's Choice" starring Mabu, Jungle Boy, script by Gaylord Du Bois, art by Tom Massey. 36 pgs., full color. Cover price $0.12. 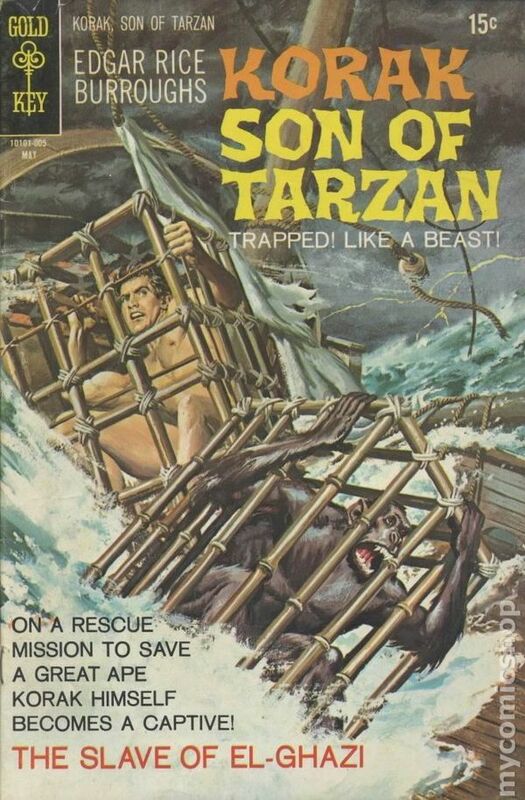 Published Jun 1968 by Gold Key/DC. 12¢ Edition. Painted cover art by George Wilson. "Giants from the Mist," script by Gaylord Du Bois, art by Sparky Moore; Korak and N'kima take a canoe by river to investigate a strange tale of giant frogs; As they near the village, Korak spies a leopard about to spring onto a white baby on the shore; He spears the cat through the heart just in time, just as its parents, a missionary couple, run up to find the boy; They take Korak back to their home for some hospitality, and explain that the villagers, guided by the witch-doctor, are going to sacrifice a goat to the giant frog that very night; Korak finds a comfy spot in a high tree to observe the frog; Meanwhile Nkima teases baby Carl back out into the jungle yet again, and down to the falls where the sacrifice is being made; The two wander out onto a slippery log overhanging the waterfalls when Korak spies them; He manages to save the baby, but Nkima falls, and the giant frog waiting below immediately licks the monkey up with his tongue; Korak spears the frog through the heart, and dives into the falls after it; He has to drag the massive corpse onto a rock, where he frees the monkey, trapped inside the gullet. "Lair of the Lion" text story. "The Amulet" starring Mabu, Jungle Boy story, script by Gaylord Du Bois, art by Tom Massey. "Iguanodon" Dinosauria article, art by Rex Maxon. 36 pgs., full color. Cover price $0.12. 15¢ Edition. Painted cover art by George Wilson. "Giants from the Mist," script by Gaylord Du Bois, art by Sparky Moore; Korak and N'kima take a canoe by river to investigate a strange tale of giant frogs; As they near the village, Korak spies a leopard about to spring onto a white baby on the shore; He spears the cat through the heart just in time, just as its parents, a missionary couple, run up to find the boy; They take Korak back to their home for some hospitality, and explain that the villagers, guided by the witch-doctor, are going to sacrifice a goat to the giant frog that very night; Korak finds a comfy spot in a high tree to observe the frog; Meanwhile Nkima teases baby Carl back out into the jungle yet again, and down to the falls where the sacrifice is being made; The two wander out onto a slippery log overhanging the waterfalls when Korak spies them; He manages to save the baby, but Nkima falls, and the giant frog waiting below immediately licks the monkey up with his tongue; Korak spears the frog through the heart, and dives into the falls after it; He has to drag the massive corpse onto a rock, where he frees the monkey, trapped inside the gullet. "Lair of the Lion" text story. "The Amulet" starring Mabu, Jungle Boy story, script by Gaylord Du Bois, art by Tom Massey. "Iguanodon" Dinosauria article, art by Rex Maxon. 36 pgs., full color. Cover price $0.15. Published Aug 1968 by Gold Key/DC. Painted cover art by George Wilson. "The Forbidden Land," script by Gaylord Du Bois, art by Dan Spiegle; While exploring Pal-Ul-Don, Korak is suddenly attacked by his old friend Om-at; Somehow Korak manages to subdue him, and Pan-at-lee arrives to explain that Om-at has a case of amnesia resulting from a battle injury; Om-at comes to and runs off, climbing the cliffs to the "forbidden land" from whence no Waz-don has ever returned; They track him onto the forbidden plateau just in time to save him from a band of cavemen; The blow of a club restores Om-at memory; The trio immediately return the way they came but darkness falls as they reach the summit of the cliffs so they stay the night in the trees; A band of white apes steal silently off with Pan-at-lee, but a slip of the paw over her mouth enables her to voice one scream for help, awakening the two males, who track the apes. "The Rogue Elephant" text story. "The Danger Trail" starring Mabu, Jungle Boy, script by Gaylord Du Bois, art by Tom Massey. "Ornitholestes" Dinosauria article, art by Rex Maxon. 36 pgs., full color. Cover price $0.12. Published Oct 1968 by Gold Key/DC. Painted cover art by George Wilson. 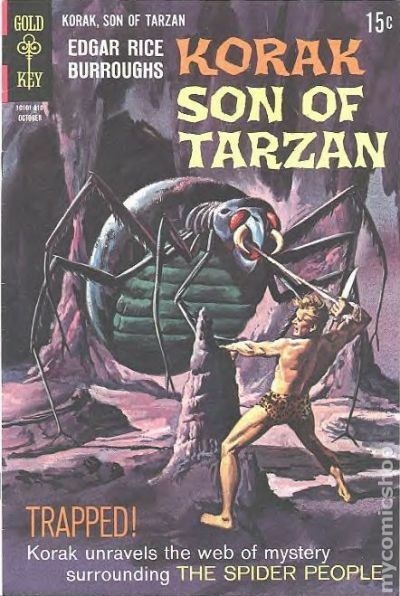 "Korak and the Spider People," script by Gaylord Du Bois, art by Dan Spiegle; While attempting to escape from the forbidden section of Pal-ul-don, Korak and his two Waz-don friends are chased into a canyon maze by a wild bull; There they are separated, and Korak comes up against a giant spider, which moves so fast that it soon has him wound up in web; Instead of eating him, however, it carries him to a lost valley where a race of seven-foot men, called Tukliks, enslave all outsiders (the reason no one has returned from the forbidden land). 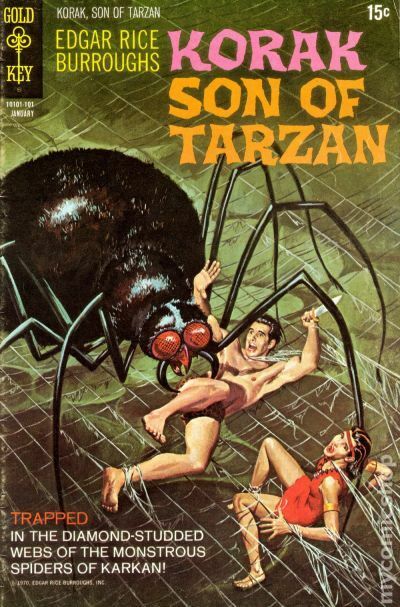 ; They pass overseers working slaves in the fields, and Korak is taken to work in the quarries; One man attempts to escape by climbing the cliffs, but a trained spider overtakes him and he leaps to his death to escape; Korak befriends a slave who tells him further horror stories; At the dinner feeding trough, Korak meets Pan-at-lee and Om-at, who were also captured by the spiders; That night Korak manages to climb up Om-at's back and leap over the fence just after the guard passes by; He jumps the guard and takes his clothes, spraying himself with the special scent that causes the spider to recognize him as a master. "The Limit of the Bag" text story. "The Jaws of Death," script by Gaylord Du Bois, art by Tom Massey. "Plesiosaur" Dinosauria article. 36 pgs., full color. Cover price $0.15. Published Dec 1968 by Gold Key/DC. Painted cover art by George Wilson. "Wings Over Pal-Ul-Don," script by Gaylord Du Bois, art by Dan Spiegle; While canoeing through a remote area of Pal-Ul-Don, Korak sees a boatload of Ho-Don priests approaching an altar high on the shore; He watches them unload a bound female captive; They place her on the altar and depart; As Korak prepares to free her, a giant eagle flies down and takes his sacrifice, carrying the girl off to a high mountain in the distance; The son of Tarzan manages to seriously wound the bird with an arrow; He trails them for many miles on the chance she might still be alive, and finally climbs the towering mountain to the nest, where the bird has collapsed at last; Suddenly its mate approaches and Korak feathers it with arrows, killing it also; The girl is alive but unconscious in the nest, and there is also a baby eagle, that tries to bite Korak's leg; Korak carries the girl down to safety in the jungle trees, and doctors her injuries; She thinks that the bird has carried her to heaven and that Korak is the son of the Sun; Each day Korak takes care of her while her injuries heal, and goes back up to visit and feed the little eaglet with meat from horta. Gold Key Comics Club News. "Jungle Jitters" text story. "The Secret Tomb" starring Mabu, Jungle Boy, script by Gaylord Du Bois, art by Tom Massey. "Ankylosaurus" Dinosauria article. 36 pgs., full color. Cover price $0.15. Published Feb 1969 by Gold Key/DC. Painted cover art by George Wilson. 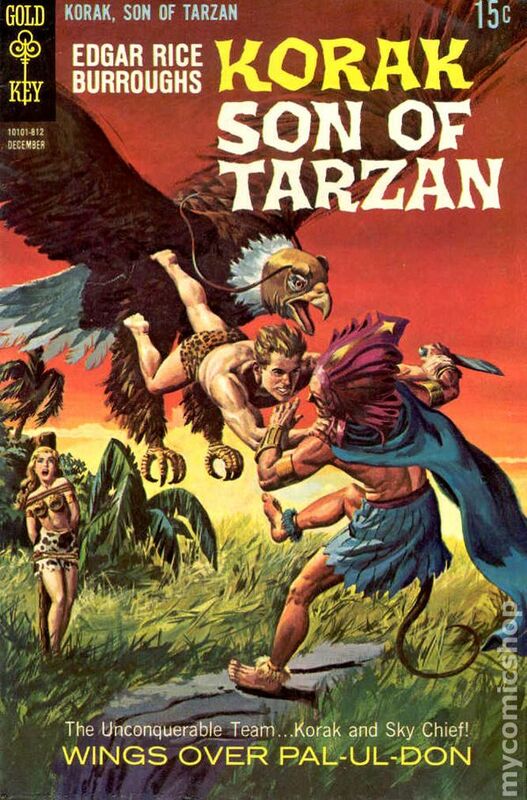 "Jungles of Ja-Lur," script by Gaylord Du Bois, art by Dan Spiegle; Korak rescues a friend from a serious head wound by bringing a doctor, then saves the doctor from a giant vulture and a gryf, and then helps his friend in a battle against an enemy tribe. "The Search" text story. "The Mask" starring Mabu, Jungle Boy, script by Gaylord Du Bois, art by Tom Massey. 36 pgs., full color. Cover price $0.15. 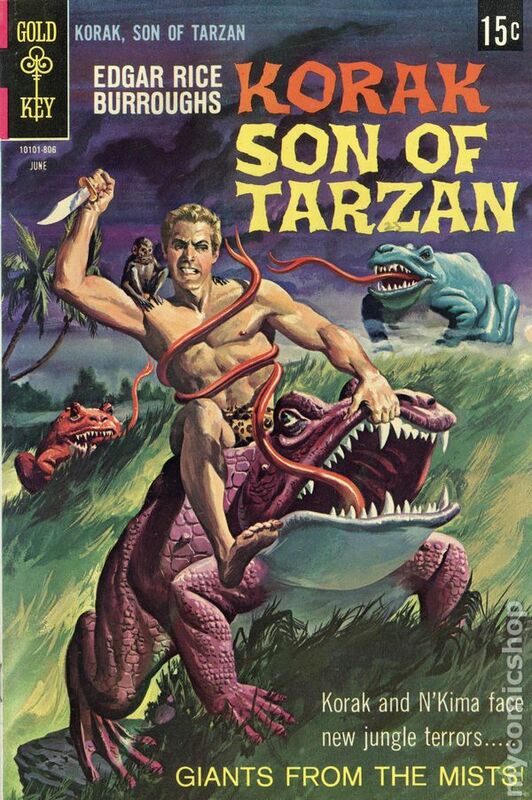 Published Apr 1969 by Gold Key/DC. Painted cover art by George Wilson. "Flight from Doom," script by Gaylord Du Bois, art by Dan Spiegle; Sleeping in a strange land, Korak and his friend Ahkut awake to find that an army of miniature men shot multiple, tiny poisonous arrows into their legs, numbing them and rendering them unuseable. "Elephants...Giants of the Jungle" article. "The Prophet" starring Mabu, Jungle Boy, script by Gaylord Du Bois, art by Tom Massey. 36 pgs., full color. Cover price $0.15. 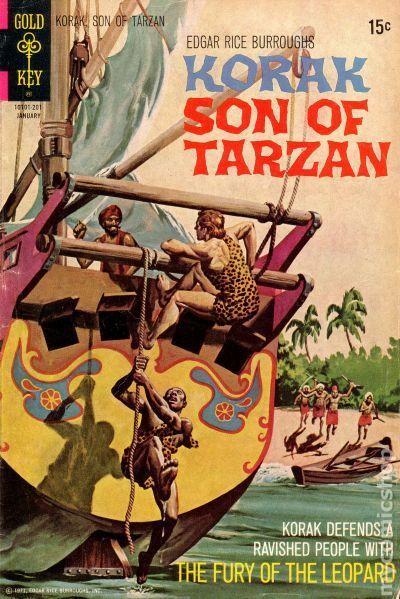 Published Jun 1969 by Gold Key/DC. Painted cover art by George Wilson. "The Magic Sticks," script by Gaylord Du Bois, art by Dan Spiegle; Korak rescues a tribe from the oppression of another tribe of destructive men with their stun sticks. "Trapped in the Tomb" starring Mabu, Jungle Boy, script by Gaylord Du Bois, art by Tom Massey. "Jungle Greenhouse" article. 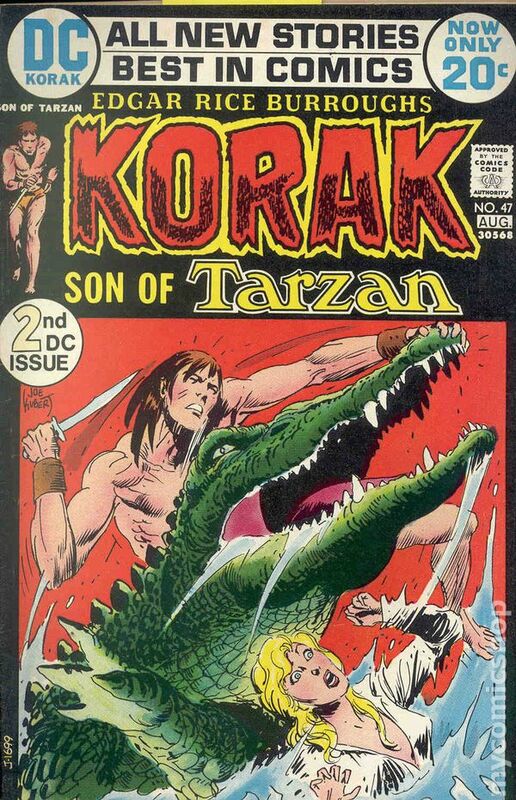 "Raider from the Swamp," script by Gaylord Du Bois, art by Dan Spiegle; Korak rescues a friends daughter and his cattle herd from a carnivorous dinosaur and her progeny. "Neanderthal Man" Prehistoria article. 36 pgs., full color. Cover price $0.15. Published Aug 1969 by Gold Key/DC. Painted cover art by George Wilson. "Valley of the Bat-People," script by Gaylord Du Bois, art by Dan Spiegle; Korak saves a boy from choking to death and then rescues his sister from a flock of blood-sucking bat men. "The New Chief" starring Mabu, Jungle Boy, script by Gaylord Du Bois, art by Tom Massey. "Colorful Baboons" article. "Intembu the Terrible," script by Gaylord Du Bois, art by Dan Spiegle; Korak saves a village which is being terrorized by a rogue elephant. 36 pgs., full color. Cover price $0.15. Published Oct 1969 by Gold Key/DC. Painted cover art by George Wilson. 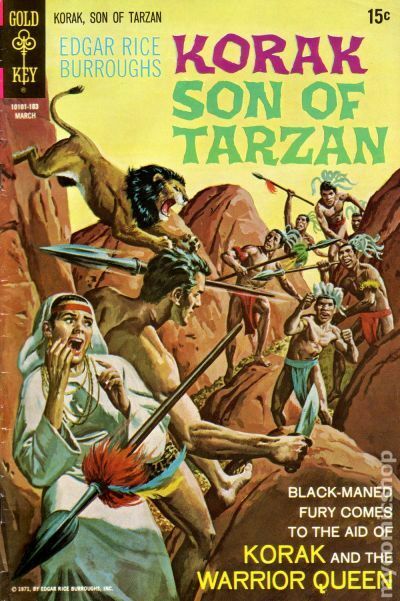 "The Knights of Tandika," script by Gaylord Du Bois, art by Dan Spiegle; Korak and Billali kill lions together and present their pelts to Queen Tandika, as does Mandyama; The queen grants them their choice of brides, which Korak declines until Mandyama chooses a white captive; They duel, Korak wins, and the queen weds Korak to Sue Randall; He assures her, though, that the marriage has no validity and that he had only gone through the ceremony so as to help her escape. Super Saturday on ABC ad. ABC's Super Saturday Club ad. "The Eagle's Nest," script by Gaylord Du Bois, pencils by Tom Massey, inks by Tom Massey; When an eagle attacks Mabu's little dog, Mabu spears the bird but fails to kill it; He later raids a large nest in hopes of eggs for food, only to be attacked himself by the furious eagle. "Trees of Africa" article. "Giants of the Snows," script by Gaylord Du Bois, art by Dan Spiegle; When a giant Torodon captures a Ho-Don girl, Korak tracks the creature to its lair and attacks, freeing the girl. Gold Key Comics Club News. 36 pgs., full color. Cover price $0.15. Published Dec 1969 by Gold Key/DC. Painted cover art by George Wilson. 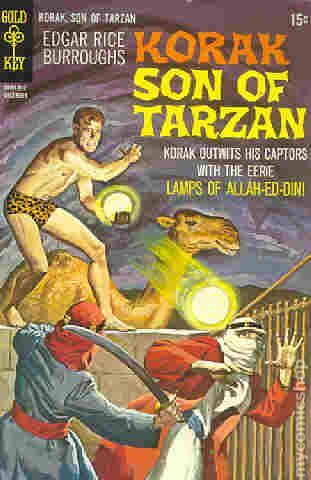 "The Lamps of Allah-Ed-Din," script by Gaylord Du Bois, art by Dan Spiegle; Korak saves a girl from a crashed plane, is captured in an underground cavern, finds the girls brother, and leads them both back to civilization. "Splendor of the Past" article. "Revenge Climbs the Wall" starring Mabu and Ras Tufari, script by Gaylord Du Bois, art by Tom Massey. 36 pgs., full color. Cover price $0.15. Published Feb 1970 by Gold Key/DC. Painted cover art by George Wilson. "M'Tugu's Revenge," script by Gaylord Du Bois, art by Dan Spiegle; After rescuing a friendly tribal chief from poisoning, Korak pursues the evil witch doctor, who has kidnapped the chiefs son; Hypnotized by a mirror shining sunlight into his eyes, Korak imagines a variety of strange animals attacking him, until he feints from the disorientation; Catching the witch doctor from behind, Korak underestimates the villains wiliness, earning a chop to the side of the neck, which floors him; While shielding the chiefs son from a volcanic explosion, the jungle boy is knocked out again by a hurtling rock to the head, just before a pack of hyenas arrives. "Veiled Warriors" article. "Signal Fire" starring Mabu, Ras Tufari, and Mustafa, script by Gaylord Du Bois, art by Tom Massey. 36 pgs., full color. Cover price $0.15. Published Apr 1970 by Gold Key/DC. Painted cover art by George Wilson. "The Warlord of Alopan," script by Gaylord Du Bois, art by Dan Spiegle; Korak and Paul D'Arnot look for Paul's son, Pierre, and find him to be the Warlord of Alopan. Gold Key Comics Club News. "Across the Sahara by Bus" article. "A New Encounter" starring Mabu, Ki-yee, Khalil, and Captain Durso, script by Gaylord Du Bois, art by Tom Massey. 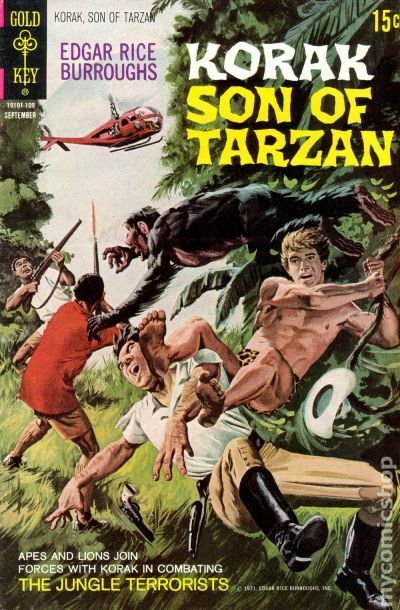 "Sudden Attack" one-page Jungle Tales of Tarzan story, art by Russ Manning and Mike Royer. 36 pgs., full color. Cover price $0.15. Published May 1970 by Gold Key/DC. Painted cover art by George Wilson. 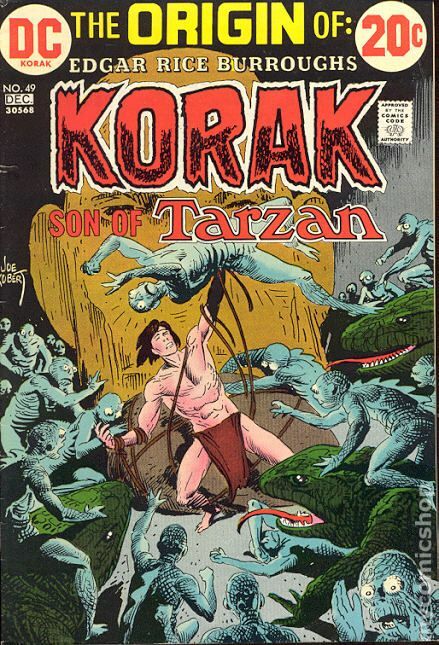 "The Slave of El-Ghazi," script by Gaylord Du Bois, art by Dan Spiegle; After surviving a shipwreck, Korak helps another survivor find and rescue his son from enslavement by a sultan. "Two-Horned Fury" article. "The Raiders" starring Mabu and Durso, script by Gaylord Du Bois, art by Tom Massey. "Jungle Musicians" article, art by Mike Arens. 36 pgs., full color. Cover price $0.15. Published Jul 1970 by Gold Key/DC. Painted cover art by George Wilson. "Canyon of the Lost," script by Gaylord Du Bois, art by Dan Spiegle; After being rescued by a girl and her father, Korak returns the favor by rescuing the girl from a vengeful ape which has abducted her. "Free and Untamed" article. "Dead Man's Gift" starring Mabu, Durso, and Omdan, script by Gaylord Du Bois, art by Tom Massey. "Your Future as a Chemist / as an Airline Stewardess" article, art by Dan Spiegle. 36 pgs., full color. Cover price $0.15. Published Sep 1970 by Gold Key/DC. Painted cover art by George Wilson. 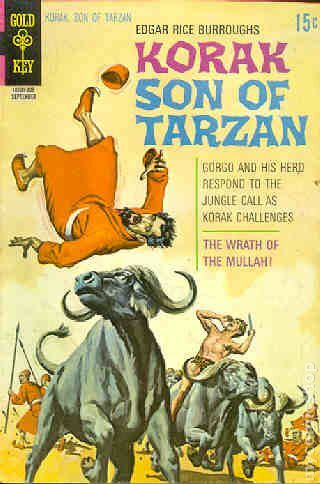 "The Wrath of the Mullah," script by Gaylord Du Bois, art by Dan Spiegle; After rescuing a girl queen and her mother from a lion, Korak is appointed regent, is wrongly accused of killing a political rival, and helps the girl and her injured mother escape from their own village. "The Tall Ones" article. "The Haunted Fortress" starring Mabu and Mursa, script by Gaylord Du Bois, art by Tom Massey. "Your Future as a Dietitian; Your Future as a Veterinarian" article, art by Dan Spiegle. 36 pgs., full color. Cover price $0.15. Published Nov 1970 by Gold Key/DC. Painted cover art by George Wilson. "Pawn of the Witch Doctor," script by Gaylord Du Bois, art by Dan Spiegle; Korak helps a Frenchman rescue his wife from the spell of a hypnotic, bloodthirsty witch doctor. "The Inland Trek" article. "The Leopard's Prey" starring Mabu and Mursa, script by Gaylord Du Bois, art by Tom Massey. "Your Future as an Oceanographer / as an Interior Designer and Decorator" article, art by Dan Spiegle. 36 pgs., full color. Cover price $0.15. 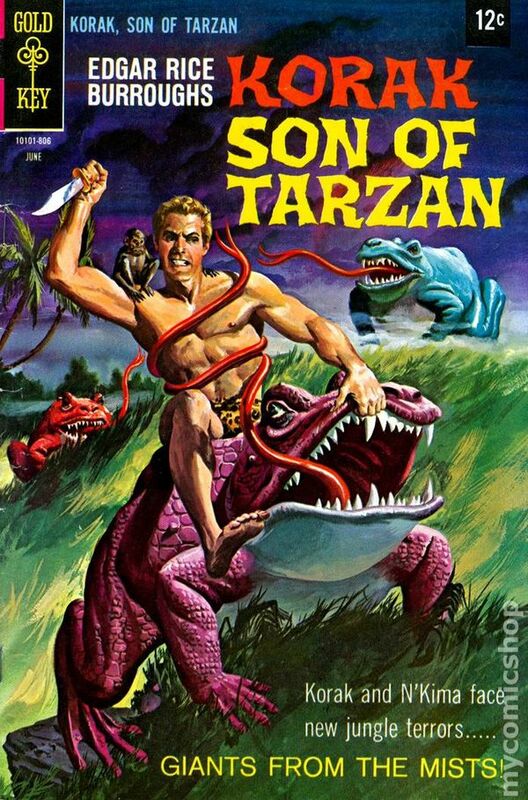 Published Jan 1971 by Gold Key/DC. Painted cover art by George Wilson. "The Jewels of Karkan," script by Gaylord Du Bois, art by Dan Spiegle; Korak saves a native girl from a band of outlaws and then rescues her again, along with a European couple, from being sacrificed to some giant spiders. "Wrestling Giants" article, art by Nat Edson. "Faster Than Camels" starring Mabu, Jungle Boy, script by Gaylord Du Bois, art by Tom Massey. "African Native Houses" article, art by Mike Arens. "Your Future As a Physician / As a Registered Nurse" article, art by Dan Spiegle. 36 pgs., full color. Cover price $0.15. 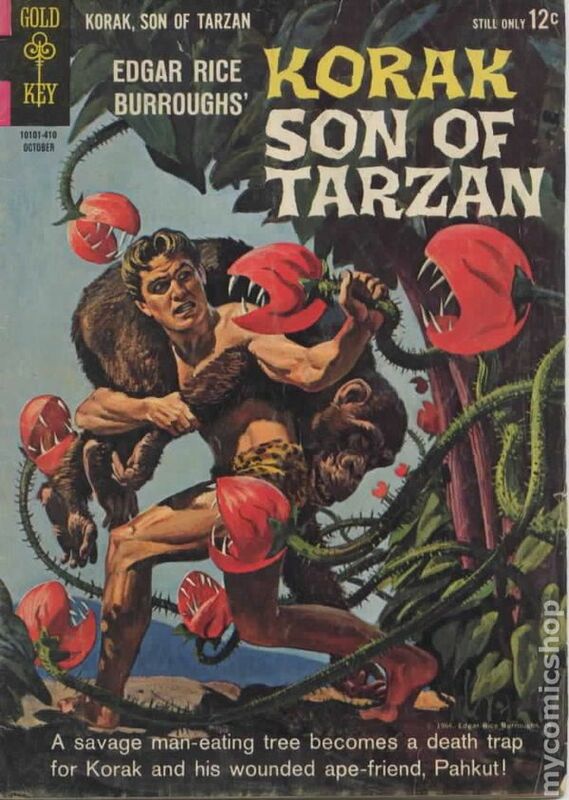 Published Mar 1971 by Gold Key/DC. Painted cover art by George Wilson. 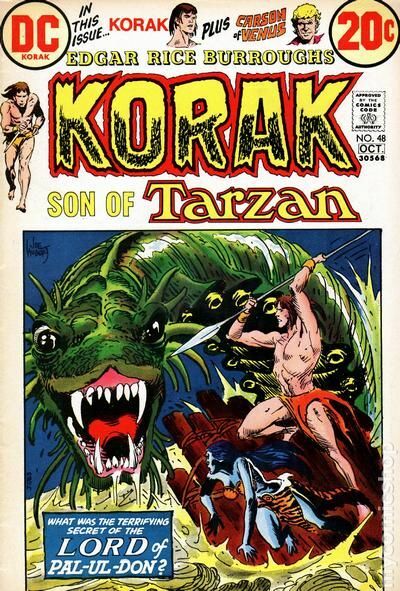 "The Warrior Queen," script by Gaylord Du Bois, art by Dan Spiegle; Korak saves a native girl from a crocodile, her queen from a forced marriage, and their tribe from a war with a neighboring chief. "The Rifle" starring Mabu, Jungle Boy, script by Gaylord Du Bois, art by Tom Massey. "Monkeys and Their Cousins" Animals of Africa article. 36 pgs., full color. Cover price $0.15. Published May 1971 by Gold Key/DC. Painted cover art by George Wilson. "The Chained Captives," script by Gaylord Du Bois, art by Dan Spiegle; Confronting some suspicious white traders and their native warehousemen by himself, Korak is taken by surprise when a large, wooden crate is placed over his head, from which he fights his way out, before being knocked unconscious and chained by his neck to a stake to await a fight to the death with a baboon. "Desert Castaways" starring Mabu, Jungle Boy, script by Gaylord Du Bois, art by Tom Massey. "Africa, the Cradle of Man" article. 36 pgs., full color. Cover price $0.15. 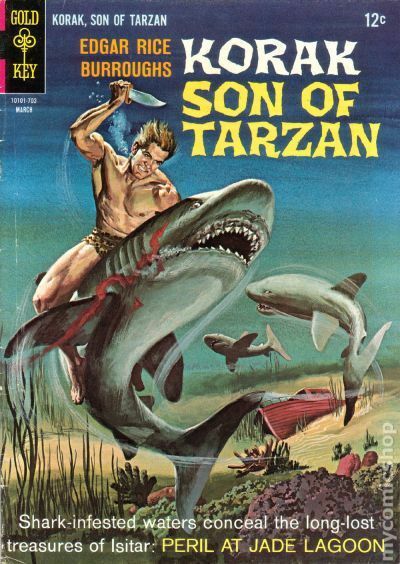 Published Jul 1971 by Gold Key/DC. Painted cover art by George Wilson. "The Battle of Burning Mountain," script by Gaylord Du Bois, art by Dan Spiegle; Korak saves a native prince from enemy warriors, and his fiancé twice and her handmaiden from an enemy prince. "Discovery KH-1" article, art by Nat Edson. "In the Warthog's Den" starring Mabu, Jungle Boy, script by Gaylord Du Bois, art by Tom Massey. 36 pgs., full color. Cover price $0.15. Published Sep 1971 by Gold Key/DC. Painted cover art by George Wilson. 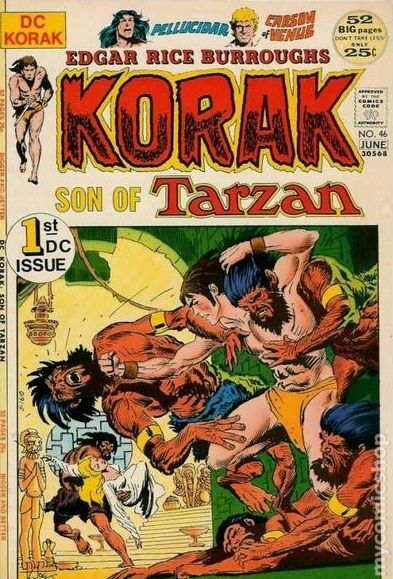 "The Jungle Terrorists," script by Gaylord Du Bois, art by Dan Spiegle; Korak escapes slave traders, defeats some poachers, and returns a warden and his daughter to civilization. "The Storm," script by Gaylord Du Bois, art by Tom Massey. "The Lotukas and the Termites" article. 36 pgs., full color. Cover price $0.15. Published Nov 1971 by Gold Key/DC. Painted cover art by George Wilson. "When Giants Feast," script by Gaylord Du Bois, art by Dan Spiegle; Korak saves twin anthropology students from becoming dinner for a bunch of giants. "Africa...Land of Variety" article. 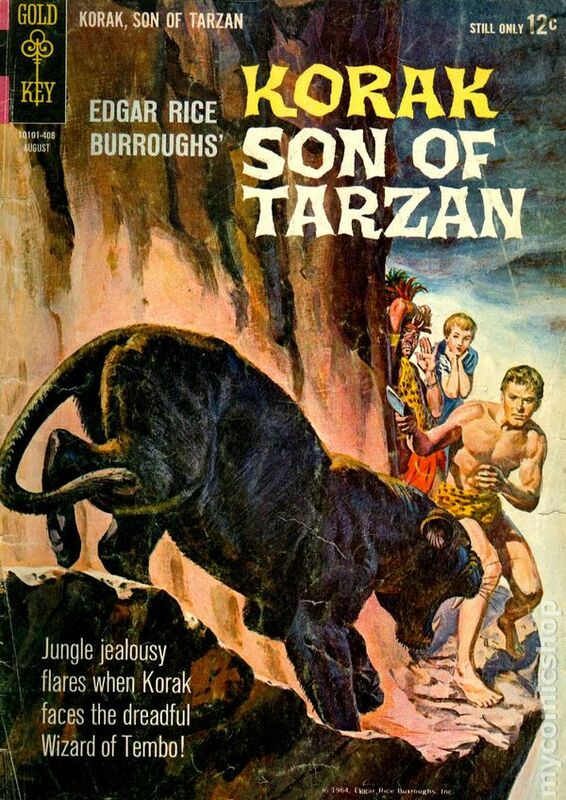 "Beast in the Rock" starring Mabu, Jungle Boy, script by Gaylord Du Bois, art by Tom Massey. 36 pgs., full color. Cover price $0.15. Published Jan 1972 by Gold Key/DC. Last Gold Key issue. Painted cover art by George Wilson. 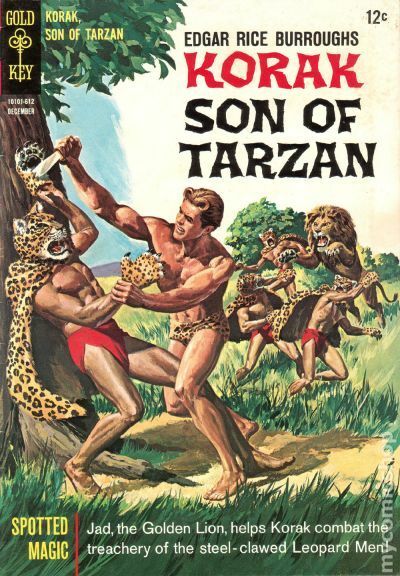 "Fury of the Leopard," script by Gaylord Du Bois, art by Dan Spiegle; Korak and a young black warrior come upon two leopards by a stream simultaneously, and each of them kills one. 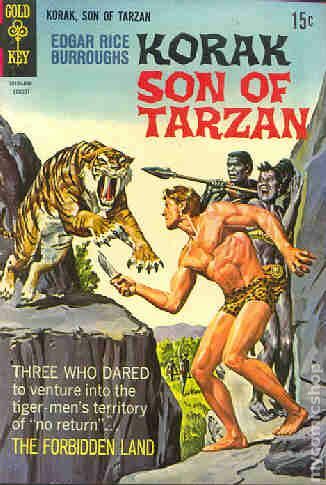 The black, Tongo, is wounded in the leg and can't walk, so Korak makes a tree-nest for him to lie in, and then tans the skins. 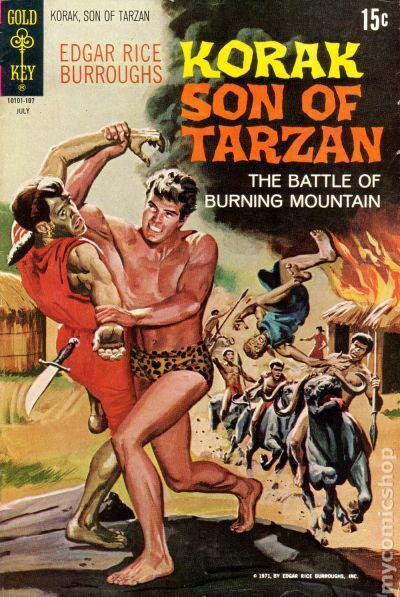 Korak leaves to find out where his tribe is located, and finds that slavers have burned the village and carried off the women; He returns to Tongo but waits to break the news; One morning Tongo takes off while Korak is out hunting; Korak trails him back to the burnt-out village and offers to aid him in retrieving his fiancé. "The Chimpanzee" Keys of Knowledge article. "Little People of the Jungle" article. "Kudu, the Crocodile's Prey" starring Mabu, Jungle Boy, script by Gaylord Du Bois, art by Tom Massey. 36 pgs., full color. Cover price $0.15. Published Jun 1972 by Gold Key/DC. 1st Issue published by DC. Cover by Joe Kubert. "The Treasure Vaults Of Opar! ", script by Len Wein, art by Frank Thorne; Korak rescues a crew from a plane crash and says he will help them find a lost archaeologist in the Forbidden City of Opar. "Mars - or Bust! ", script by Len Wein, art by Mike Kaluta; Carson Napier takes off for Mars, but ends up on Venus instead; When he parachutes to the surface, he pincher-clawed beast attacks him; Three Venusians rescue him, but take him as their captive. "The World Within," script by Len Wein, art by Alan Lee Weiss; Adaptation of Edgar Rice Burroughs' At the Earth's Core; Continues in Weird Worlds #1. 52 pgs., full color. $0.25. Cover price $0.25. Published Jul 1972 by Gold Key/DC. Cover by Joe Kubert. "The War Machine! ", script by Len Wein, art by Frank Thorne; After rescuing a young lady from drowning in the river, Korak boards a boat that is headed to deliver supplies to several Nazis stationed at a nearby mining camp. "The Girl in the Garden," script by Len Wein, art by Mike Kaluta; Adaptation of Edgar Rice Burroughs' Pirates of Venus. 36 pgs., full color. $0.20. Cover price $0.20. Published Oct 1972 by Gold Key/DC. Cover by Joe Kubert. "Lord of Pal-Ul-Don," script by Len Wein, art by Frank Thorne; The Pal-ul-don Tribe have become slaves to a tyrant; He wants them to raid villages for treasures, and have it melted down in order for them to erect a huge, golden statue of his face. "Battle Cry! ", script by Len Wein, art by Mike Kaluta; During a jog, Carson comes upon some thieves; He realizes that the thieves mean to harm a beautiful woman in the garden; He leaps into action believing he will startle the intruders, instead they turn to fight, with weapons in hand; Though out-numbered five-to-one, Carson battles them, but then retreats when he notices several Venusian warriors coming after the intruders too; Adaptation of Edgar Rice Burroughs' Pirates of Venus. 36 pgs., full color. $0.20. Cover price $0.20. Published Dec 1972 by Gold Key/DC. Cover by Joe Kubert. 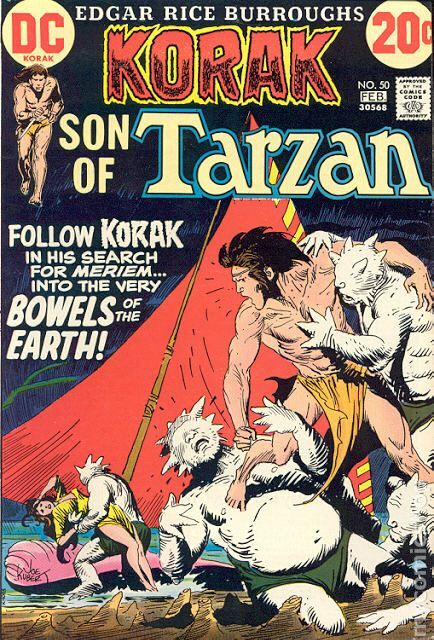 "The Search," script by Joe Kubert, art by Frank Thorne; Korak rescues a girl from a slave camp; The next morning as he hunts for food, the pirates kidnap the girl and gives her over to the Lizard-Men; Korak begins searching for the girl. "Gathering Tarel," script by Len Wein, art by Mike Kaluta; While jogging, Carson comes upon thieves and battles them; When Venusian warriors enter the scene, Carson retreats; Carson hunts for "Tarel" in the lush Venusian forest with Duran's son, Kamlotad; Adaptation of Edgar Rice Burroughs' Pirates of Venus. 36 pgs., full color. $0.20. Cover price $0.20. Published Feb 1973 by Gold Key/DC. Cover by Joe Kubert. "Underworld," script by Robert Kanigher, art by Frank Thorne; Korak searches for his beloved Meriem inside a volcano; An earthquake thwarts his rescue and she plummets down a pit; He then teams with a strange professor to continue the search. "By Kamlot's Grave," script by Len Wein, art by Mike Kaluta; While searching for "Tarel" (cobwebs), Karson and Kamlot climb up a tree only to find a giant spider ready to protect its web; While going home through the forest, they get attacked by flying furies (Klangan) Adaptation of Edgar Rice Burroughs' Pirates of Venus. Ad for Blazing Combat Stories. 36 pgs., full color. $0.20. Cover price $0.20.